Pascal Gielen, co-editor of the recently published volume Community Art, will draw out a critical cartography of community art and will speak about the power and impotencies of this phenomenon. Since modernity, art and community, artist and social work have had an ambivalent relationship. Can art have a role in building communities? What is the political potency of forms of art that strive to integrate individuals and social groups? 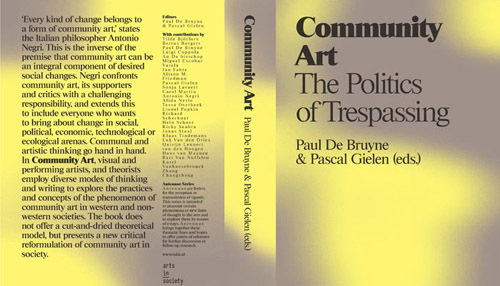 In the book Community Art: The Politics of Trespassing (Paul De Bruyne, Pascal Gielen, eds. ; Valiz, 2011) the Italian philosopher Antonio Negri states ‘Every kind of change belongs to a form of community art’. This is the inverse of the premise that community art can be an integral component of desired social changes. Negri confronts community art, its supporters and critics with a challenging responsibility, and extends this to include everyone who wants to bring about change in social, political, economic, technological or ecological arenas. Communal and artistic go hand in hand. The event is organized and moderated by artist Hakan Topal with a response by artist Alex Villar. Pascal Gielen is professor of sociology of the arts and director of the research centre Arts inSociety at Groningen University (NL), and also director of the research group and book series ‘Arts in Society’, Fontys College for the Arts, Tilburg (NL). Forthcoming spring 2012: Gielen, De Bruyne (eds. ), Teaching Art in the Neoliberal Realm: Realism versus Cynicism (Valiz, Amsterdam 2012). Thanks to Anne Barlow, Executive Director, Art in General and Vera Zolberg, Professor of Sociology, New School for Social Research.